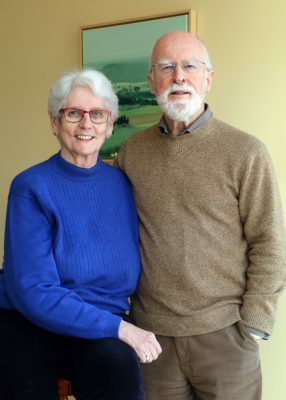 Born and raised in the U.K., Stella and Bill Lord emigrated to Canada in January 1966. Having lived, worked, and studied in several cities across Canada, they finally settled Halifax in 1986, the city they now call home. The Lords became involved with the Nova Scotia Youth Orchestra in the early ’90s when their daughter, Kate, joined the string section. She was 15 at the time, and had experience with the St. Pat’s High School string orchestra as well as the Halifax Schools Symphony Orchestra. Kate started violin lessons at age four with the Suzuki method, and continued with several years of private violin lessons with Symphony musician Karen Langille. At that time, the Youth Orchestra was primarily run by parents of players, and Bill served on the board for three years until their daughter left to study in France. Bill and Stella also took out their first season subscription to Symphony Nova Scotia around that time. “Music really became an important part of our lives because of our daughter’s involvement,” says Stella, “and through Karen, we started going to Symphony concerts.” They also started attending a number of fundraisers, and eventually became loyal annual donors of both the Symphony and the Youth Orchestra. In 2011, Bill returned to volunteer work with the Youth Orchestra when he was asked to take on the role of Chair. He continued to serve on the executive for the next eight years and throughout a time of historic transition. “Like many small arts organizations, the NSYO was struggling financially. We had talked about being ‘adopted’ by Symphony Nova Scotia a number of times over the years, so it wasn’t the first time we thought about it. We knew there were other youth orchestras across the country that were connected to major orchestras (e.g., the Toronto Symphony). It seemed to us as a board – and especially to [NSYO Music Director Dinuk Wijeratne] – that the idea would make so much sense. “Our Youth Orchestra had been gradually shrinking. Our concern, when we talked to friends and people in the community, was that few had any idea that we even existed. The NSYO didn’t have the money or resources to do the necessary outreach to address that. We really needed to get our name known. “We saw this as such a positive thing; it would give the kids a closer relationship to the Symphony players. “This is one of the great things about having the Youth Orchestra under the Symphony umbrella now; for example, the concert in North Preston for Black History Month. That is something that would have been very difficult for the Youth Orchestra to organize and setup on its own. The Symphony has the personnel and the infrastructure to be able to do that. Now, the scope of the outreach is much broader. Bill and Stella have a long history and are very personally invested in the Youth Orchestra as a cause. It may come as no surprise that, several years ago, they made the decision to include a gift in their will for the Youth Orchestra. They are currently in the process of reviewing and renewing their will, and at the same time reassessing their priorities for the charities they support. As the Nova Scotia Youth Orchestra no longer exists as a charitable entity, they will be renaming the beneficiary as Symphony Nova Scotia. To learn more about Legacy Giving, please contact Rose Spicer at 902.421.4402 or at RoseSpicer@symphonyns.ca.